Millions of buffalo once roamed North America, grazing the plains and prairies and populating the mountains. Historical documents around the time of Columbus's arrival describe the animals' importance to the indigenous people. According to early explorers, "the plains were black and appeared as if in motion" with buffalo herds. Woven into the fabric of Native American life for millennia, the buffalo was revered and honored. Some scholars argue that extermination of the buffalo was an official policy of the US government in order to achieve extermination of the Native Americans, particularly those living in the Western Plains. We will examine this theory, as well as the history of the settlement of the "American West". Virtually every part of the United States except the Eastern Seabord has been "the West" at some point in American history, linked in popular imagination with the last frontier of American settlement. But it is especially that vast stretch of plains, mountains, and the desert west of the Mississippi that has loomed so large in American folklore, a region of cowboys, Indians, covered wagons, outlaws, prospectors, and a whole society operating outside the law. As with the other sections of the United States, regional boundaries are somewhat imprecise. The West of the cowboy and cattle drive covered many non-Western states, including Kansas and Nebraska. Much of the West's fiercest Indian fighting took place in the Dakotas, both of which are now considered to be part of the Middle West. Much of the West became part of the United States through the Louisiana Purchase of 1803, the Southwest however, was a Mexican possession until 1848. The Lewis and Clark Expedition of 1804-1806 established much of what would become the Oregon Trail and thereby facilitated settlement of the Pacific Northwest, an area soon known for its richness in furs, timber, and salmon. The discovery of gold in California in 1848 brought a burst of migration to the West Coast and led to California's admission to the Union in 1850, barely two years after it had been ceded from Mexico. The first British settlers in the New World stayed close to the Atlantic, their lifeline to needed supplies from England. By the 1630s, however, Massachusetts Bay colonists were pushing into the Connecticut River valley. Resistance from the French and the Indians slowed the movement westward, yet by the 1750s northern American colonists had occupied most of New England. The British Proclamation of 1763 ordered a halt to the westward movement at the Appalachians, but the decree was widely disregarded. Settlers moved into Ohio, Tennessee, and Kentucky. After the American Revolution, a flood of people crossed the mountains into the fertile lands between the Appalachians and the Mississippi River. By 1810 Ohio, Tennessee, and Kentucky had been transformed from wilderness into a region of farms and towns. Despite those decades of continuous westward pushing of the frontier line, it was not until the conclusion of the War of 1812 that the westward movement became a significant outpouring of people across the continent. By 1830, the Old Northwest and Old Southwest-areas scarcely populated before the war--were settled with enough people to warrant the admission of Illinois, Indiana, Missouri, Alabama, and Mississippi as states into the Union. During the 1830s and ‘40s, the flood of pioneers poured unceasingly westward. Michigan, Arkansas, Wisconsin, and Iowa received most of them. A number of families even went as far as the Pacific coast, taking the Oregon Trail to areas in the Pacific Northwest. Between the gold rush and the Civil War, Americans in growing numbers filled the Mississippi River valley, Texas, the southwest territories, and the new states of Kansas and Nebraska. During the war, gold and silver discoveries drew prospectors--and later settlers--into Oregon, Colorado, Nevada, Idaho, and Montana. By 1870, only portions of the Great Plains could be truly called unsettled by the descendants of the first colonists. For many decades, most Americans knew of the Great Plains simply as the Great American Desert, an inhospitable area of poor soil, little water, "hostile" Indians, and general inaccessibility. But the years following the American Civil War changed that conception. In 1862 the Homestead Act was passed by Congress; in 1869 the first transcontinental railroad was completed; and in 1873 barbed wire fencing was introduced. Coupled with improvements in dry farming and irrigation and the confinement of American Indians to reservations, after much brutal warfare, the Great American Desert grew steadily in population. By late 1880, with the decline of the range-cattle industry, settlers moved in and fenced the Great Plains into family farms. That settlement--and the wild rush of pioneers into the Oklahoma Indian Territory--constituted the last chapter of the westward movement. By the early 1890s, a frontier had ceased to exist within the 48 continental states. What came to be known as the Indian Territory was originally all of that part of the United States west of the Mississippi, and not within the States of Missouri and Louisiana, or the Territory of Arkansas. Never an organized territory, it was soon restricted to the present state of Oklahoma. The Choctaw, Creek, Seminole, Cherokee, and Chickasaw tribes were forcibly moved to this area between 1830 and 1843, and an act of June 30, 1834, set aside the land as Indian country which later came to be known as Indian Territory. In 1866, the western half of Indian Territory was ceded to the United States, which opened part of it to white settlers in 1889. This portion became the Territory of Oklahoma in 1890 and eventually encompassed the lands ceded in 1866. The two territories were united and admitted to the Union as the state of Oklahoma in 1907. The North American Plains Indians were essentially big-game hunters, the buffalo being a primary source of food and material which was used for clothing, shelter, tools and religious icons. The peoples of the Plains are typically designated by the languages they speak. It should be noted, however, that in some cases the designation covers several completely autonomous political divisions. For example, the designation of Dakota, covers several different (and autonomous) political divisions. The northern and southern divisions of the Cheyenne retained their unity as a tribe, while the Pawnee on the other hand comprised at least four independent groups. Many of the nations or tribes from the Plains migrated from the prairies and woodlands of the east. Six distinct language families or stocks were represented in the Plains area, although none was confined to it. Sign language provided a common, if limited means of communication among tribes speaking different languages. This was a system of fixed hand and finger positions symbolized ideas, the meanings of which were known to the majority of the tribes of the area. The Indian Removal Act of 1830, was the first major legislative departure from the US policy of respecting the legal and political rights of the American Indians. The act authorized the president to grant Indian nations unsettled western prairie land in exchange for their desirable territories within state borders from which the tribes would be removed. Although the bill provided only for negotiation with tribes east of the Mississippi on the basis of payment of their lands, trouble arose when the United States resorted to force to gain the Indians' compliance with its demand that they accept the land exchange and move west. A number of northern tribes were peacefully resettled in western lands not considered useful to the white population. The problem lay in the Southeast, where members of what were known as the Five Civilized Tribes (Chickasaw, Choctaw, Seminole, Cherokee, and Creek) refused to trade their cultivated farms for the promise of strange land in Indian Territory with a supposed permanent title to that land. Many of these Indians had homes, representative government, children in missionary schools and trades other than farming. Some 100,000 tribespeople were forced to march westward under US military coercion in the 1830s. Up to 25 percent of the Indians, many in manacles (shackles for the hands) perished on the way. The trek of the Cherokee in 1838-1839 became known as the Trail of Tears. Also reluctant to leave their lands were the Florida Indians, who fought resettlement for seven years (1835-42) in the second of the Seminole Wars. The frontier began to be aggressively pushed westward in the years that followed, upsetting the "guaranteed" titles of the displaced tribes and further reducing their relocated holdings. Some scholars suggest that in order to make migration to the west easier, the US government, through the Army, adopted a policy to exterminate the buffalo. Extermination of the buffalo would inevitably mean the demise of the Indians who so relied on them for almost every aspect of their existence. "'In the fall of 1885, when I, as a young acting assistant surgeon, United States Army, was stationed with A Troop, Fifth Cavalry for a short time at Cantonment, Indian Territory, we had several bands of Cheyennes under our care. Among the chiefs we had Stone Calf, Little Robe, Spotted Horse and White Horse. Having learned the sign language, I had many talks with these Indians:"
"'Stone Calf and Little Robe were greatly troubled over the disappearance of the buffalo. They told me that the great spirit created the buffalo in a large cave in the Panhandle of Texas; that the evil spirits had closed up the mouth of the cave and the buffalo could not get out. They begged me to get permission from the great father at Washington for them to go and open the cave, and let the buffalo out. They claimed to know the exact location of the cave. They even wanted me to accompany them.'" --Surgeon O. C. McNary (Buffalo Days, p. 349). Some say the slaughter of the great buffalo herds of the West took place between 1874 and 1884. The Southern herds of in the Texas panhandle were gone as early as 1878. 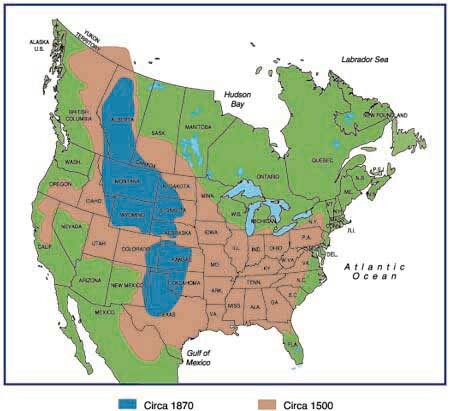 The picture at the right shows buffalo populations circa 1500 (in brown) and what remained circa 1870 (in blue). Human fatalities were somewhere in the millions. The link is indirect. The strategy of the US military was to kill buffalo in order to destroy the Native American Indian population. While the the military would not hesitate to kill Native Americans directly, the focus of this paper is the strategy of buffalo extermination. Through this indirect strategy, almost total genocide of Native American populations living in the American West was achieved. Extremely high. Efforts by the US government to exterminate the buffalo were, according to some scholars,intended to wipe out the Native American Indian population in order to "make room" for "American" settlers and cattle. The displacement, death, and practical annihilation of Native Americans and their cultures. And, the quasi-extinction of the buffalo. Into the Wilderness Dream: Exploration Narratives of the American West, Edited by Donald A. Barclay, James H. Maguire, and Peter Wild. University of Utah Press, 1994. Adventures on the Western Frontier, John Gibbon, edited by Alan and Maureen Gaff. Indiana University Press, 1994. Buffalo Days: Forty Years in the Old West: the Personal Narrative of a Cattleman Indian Fighter, and Army Officer Colonel Homer W.Wheeler. The Bobbs-Merrill Company, 1925. Cavalier in Buckskin: George Armstrong Custser and the Western Military Frontier, Robert Utley. University of Oklahoma Press, 1988. The Military and United States Indian Policy 1865-1903 Robert Wooster, Yale University Press, 1988.